Hi everyone! 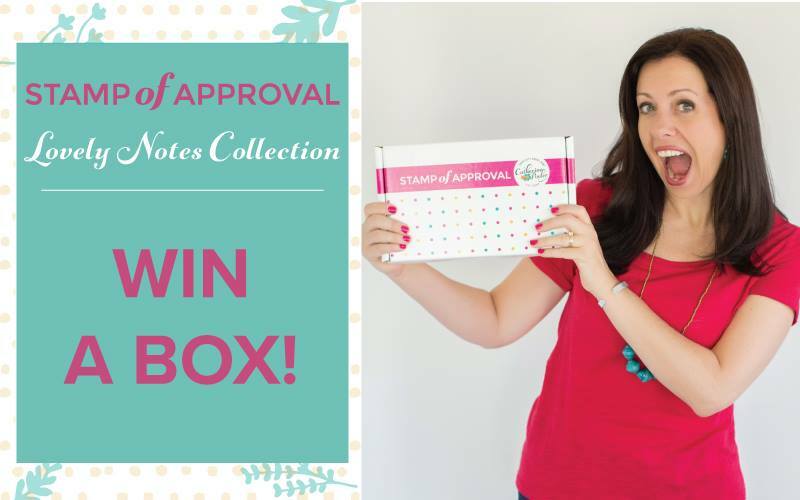 I am so excited to be participating in a blog hop celebrating the release of the Stamp of Approval Lovely Notes Collection. Today myself and many of my favorite designers are sharing cards using the Lovely Notes collection. The Stamp of Approval is an exclusive collection of stamps, dies and accessories hand picked by Catherine Pooler. The box goes up for sale tomorrow at 10am. StampNation members get the sales link one hour earlier at 9am EST. My first card features the Concentric Circles die and Handpainted Thanks stamp set. I am in LOVE with this new Concentric Circles die! It is so awesome! I used the inlaid die cutting technique on this card and also some masking and sponging. AND that Thanks sentiment, yes please!!! I used only the solid image, but there are two other stamps in the set to create a handpainted look. So fun!!! My next card features Wonderful Wreath & Butterfly Notes stamp sets. Isn't this wreath swoon worthy?! I just love it. I stamped it going off my white panel then added the flowers and bow. I am absolutely in love with the font on this thank you from the Butterfly Notes stamp set! There are other sentiment stamps in this set that you can stamp under the thank you as well. 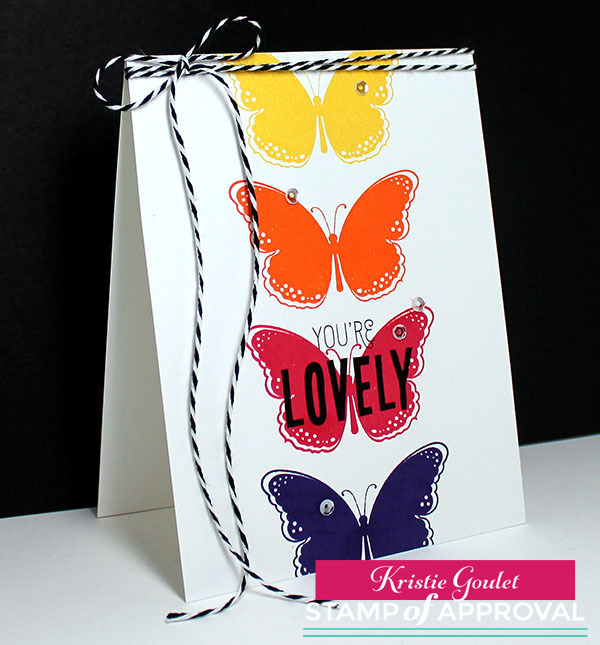 My last card features Butterfly Notes & Lovely Flowers stamp sets. I love all the butterflies in the Butterfly Notes stamp set, but I am a bit partial to this one. I used my Misti to stamp them down the center of my card. The sentiment is from the Lovely Flowers stamp set. Added a few sparkly clear sequins & some black and white twine to finish off this one layer card. Make sure to leave a comment on each stop along the hop. Three lucky commenters will win a Stamp of Approval box. The more times you comment, the more chances you will have to win! You've got until Thursday at 9:00AM EST to get those comments in. The winners will be announced on Catherine's blog! Good luck and happy hopping! Yoonsun Hur- GO HERE NEXT! What a beautiful wreath card! Such lovely cards! Thanks for sharing your gift with us! Your cards r bold and striking! You are amazing! LOVE each one of these cards! These are such pretty cards. Each one was more stunning than the previous one! The butterflies are amazing! Thanks for the inspiration. WOW Kristie, I love them all! Beautiful designs - I particularly like the butterfly card. It really pops! Beautiful cards! I'm especially loving the wreath and butterfly cards! Great job! I just love that die set too! Your use of colour is perfect, as is the asymmetric aspect of the wreath! Well done! Love the cards! I like how many different ways people are using the concentric circle die. The card with the butterflies is beautiful! I love how you used the wreath. Simple, but striking! All your cards are wonderful!!!!!!!! I looked at the first one and thought Oh my how beautiful! And as I scrolled down and saw each one they kept getting better and better. Loving the sets, thanks for the great ideas!!! Your cards are pretty. I like the simplicity. Kristie - great cards! Don't you just love this collection? I'm in awe of how you did the inlaid die cutting technique. Quite spectacular. And the simplicity but elegance of the butterfly card and wreath card are worth a CASE. They are all three great cards. Love anything with butterflies! The wreath is so very pretty, can't wait to get it and try working with it. The concentric circles die is awesome. I just love how your cards are so different. It really opens my eyes up to how many different things can do with the same tools. Love your cards, I can't pick a favorite. Really want the new SOA box. like that but I'm going to change that now. Kristie, your cards are so pretty!! Love the bright colors! Love your wreath card, very chic. All three of your cards are awesome. Really liking the row of butterflies! The concentric circles is absolutely beautiful. From all of the hops I can tell there is so much you can do with that die. Beautiful cards... Butterflies I love!! All your cards are great but I really loved the wreath card!! So soft and pretty and eye-catching!! Very pretty. Love the versatility of these stamps. Thanks for the great ideas. Beautiful cards. My favourite is the concentric circles thanks. Yum! Your cards are awesome. Bold colors great design! Thanks for sharing. All the cards are so bold and beautiful! Great job! Wow - these cards are gorgeous!! Thanks so much for sharing your creativity! Gorgeous cards, Kristie. Love how this new collection contains such a variety of products allowing you to go from bold and graphic to fun and elegant and everything in between, as your samples clearly demonstrate. Gorgeous!! I especially love the bright and bold butterfly card!! Beautiful cards! Love the Concentric Circles die! Your wreath and butterflies cards are beautiful also! Fabulous SOA collection! I seriously LOVE all these cards! I love the bright colors on the 1st card! I can't wait to get my hands on that wreath die & try it out like you did with the flowers & those bright butterflies...WOW. thank you! I love that concentric circles die, too - so many possibilities. Your cards are stunning. All the cards are lovely. The circle die is amazing but I also like the wreath. Love the color schemes you selected! All beautiful cards! I am drawn to your butterflies. Amazing cards, Kristie! I love what you did with the inlaid die cutting technique! Simply beautiful! Oh wow Kristie, you really knocked this one out of the park my friend! The stamping on your cards is so clean, crisp and vibrant against the white backgrounds. The details of the butterflies is ah-mazing!! Awesome work!! Love your pretty and fun cards!!! Butterfly Notes is my absolute favorite but Concentric Circles is a very close second!!! TFS! As always, you are brilliant with your card designs! I love all 3 but the wreath is a favorite!! I just fall more and more in love with that die set and those butterflies. Nice job!!! Your cards are absolutely gorgeous. The colors you used are just fabulous on each card. I can't even decide which I like best - each card is simple and lovely. Great job. I agree with you about that particular butterfly. Can't wait to start using the collection. It will be my second. Hope to win it. Love your cards Kristie, especially the one with the wreath, so pretty. Those concentric circles! And I love the colors with the black background. I too am loving that Concentric Circles die. There seems to be so many ways you can use it. I am definitely going to CASE your cards. Beautiful cards. Love the bright bold colors on the concentric circle card. The wreath and butterfly cards are so classy looking. Thanks for sharing. Okay, I already loved the concentric circle die and now your second card has hooked me on the Wonderful Wreath stamp set. This SOA goes over the top and Kristie you have highlighted the best of the box contents. Fab cards, but I'm partial to the butterfly one too! Gorgeous cards...the wreath card really caught my eye especially the way you stamped it off the side. So pretty...My favorite is the concentric circle one. Love these colors. The sequins add a nice touch on he butterflies. Whoa.. Loved your thank you wreath. Do love butterflies in vivid colors! Oh my gosh your cards are awesome!. I love that concentric circle die and how you did the coloring and mounted it on the back. Oh how I would love to win this box so many cool stamps and dies in it. WOW.... Kristie, they all are gorgeous, fantastic and elegant.... That concentric circle die is amazing! The butterflies and wreath stamps are beautiful. Love the color pallette in your first card!!! Beautiful cards, but the butterfly is my favorite! wonderful cards Kristi - especially love the wreath! Wow you made some Gorgeous cards. Love these cards! Cannot wait to get mine! So excited to play! Oh my goodness, Kristie your cards are wonderful. I am partial to the concentric die card. Loving the colors. Love all your cards - so pretty! What an awesome collection. Bold and beautiful. Love this SOA set of stamps & dies. Such fabulous cards! I love the color combos and clean style. All 3 cards are fantastic. The butterflies are beautiful! I am going to love having such a selection of these little guys to choose from. Your cards ROCK! Kudos to you!! I love your cards not only because they just look great, but you are using purple, tiny flowers and gorgeous wreath, and butterflies...what more could one ask! Love, love, love your butterflies. Once again, beautiful cards with beautiful colors! Love the wreath! Thanks! Amazing cards! Love those butterflies and the entire collection! I love all of these but my fave is the wreath! Love the colors! Those are awesome! Oh my, oh my, oh my! These cards are special, the just pop! Thanks for sharing! Love the simplicity of the cards! Love the use of the wreath with the thank you sentiment. The use of the purple and black with the concentric circles gives the card a very sophisticated look. 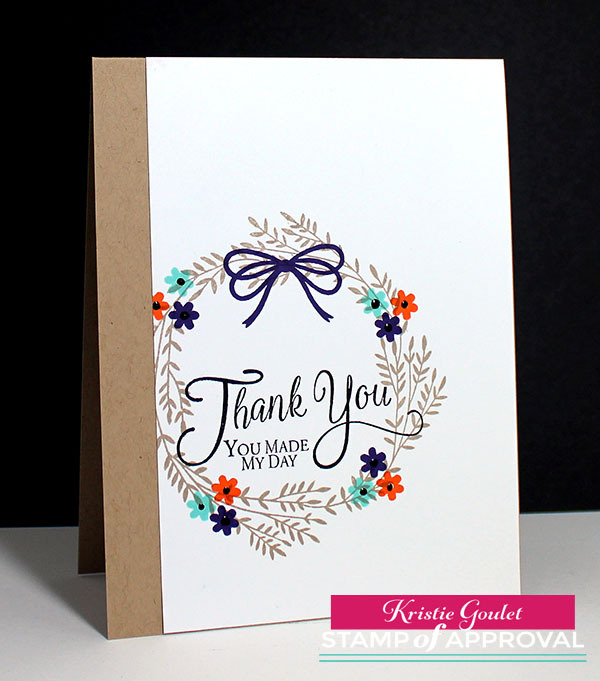 Love your use and layout of the concentric circles die along with the colors scheme to produces a card with punch. And the wreath card colors really grabbed me. Thanks. Your cards are wonderful! Love the colors on the Concentric Circles Die card! The butterfly card is lovely! Love all three of your cards, Kristie! This set is wonderful! Can't wait to get my hands on it! I love the colours on the butterfly card and the look of the 2nd card. I love all your cards but the one with the concentric die is WOW!! Love your bright, dramatic and yet simple style. Great cards. Thanks for these wonderful cards. Such great ideas! Your wreath card is beautiful! I like the wonderful colors on all of your cards. Love the butterflies and the thanks card. Such great ideas, very colorful. WOW Kristie, you really outdid yourself. The layout and color combo on the wreath card is fabulous. That Concentric Circles Die card really packed a punch and the Handpainted Thanks is perfect. Loved the bright colors on your Butterfly card. You have a triple winner with these cards. Thank you for sharing. Love, love, love. Your designs are beautiful! Love the cards. Bright colors and clean designs. All such beautiful cards!! Love that wreath! gorgeous! LOVE the wreath card! I have such a hard time envisioning how to use certain stamps. The wreath stamp is becoming one of my favorites in the collection. The butterfly card is so bright and the ink is so perfect. Really lovely! Gorgeous cards Kristy I love that wreath stamp set!! I'm going to use your wreath card as a springboard, since I struggle with how to use Kraft paper. I love it! Love the colors. Beautiful cards! Love the box idea! The cards are wonderful by the way!!! Absolutely stunning cards, Kristie!! I just adore your style! Unique circle die! Great cards! Kristie , each click down with my mouse brought another WOW .. I love your colour combinations in all these cards - the butterfly card is stunning . thank you for sharing your awesome cards . The concentric die has endless possibilities; so versatile! I love the wreath with the neutral color and bright flowers! Just WOW! I love every card made with that circle die. Your cards and colors are awesome. I am head over heels with the concentric circles die...amazing card!! Wow just awesome. I love the ideas. Looks like a great kit, Kristie! Love the delicate wreath! Love the different styles you captured with each card! Graphic, pretty and striking. I follow you on Flickr and will be interested to see other cards you make with this SOA release. Great cards and designs Kristie! Kristie, I love your cards; so pretty. I love how cool the concentric circle card is with the black, white, teal and purple. I love, love the wreath and butterfly cards...FABULOUS! Wow, three fabulous designs! I am so loving the color combo you chose for those funky circles! The more I see, the more I love! Your cards are beautiful! My favourite the concentric circle one, fabulous colour combination. All great! Liking the bright colors and bold look. Loving the Concentric Circles die. Your wreath card is my favorite! So pretty! Triple hit out of the park with your cards. Love the design and the colors. Thanks for your inspiration. Wowza! Those are very fun & awesome cards! Love all your cards, but that one using the concentric circle die looks sharp! I love the clean approach to the butterflies - very, very cute card. I love the color choices and simplicity of the other two cards but I have to say, my favorite card is the one with the concentric circles - reminds me of a dress I used to own. I love all three cards! The concentric circles card is so bold that it really makes a statement. The wreath card is my favorite with the delicate wreath, warm flowers, and strip of Kraft cardstock. The bright butterflies would cheer anyone up! Great cards I love them all! Gorgeous! Love them all, especially the wreath thank you! I haven't been able to splurge on a SOA box as of yet but going to have to this month!!! Love everything in this collection!!! Fabulous cards! They're all wonderful - the blending of colours on the first, that super cute wreath, but I think the butterflies are my favourite! Amazing cards! I must have that wreath stamp. The colors on your cards are just fabulous. All your cards are just wonderful, the butterfly one has to be my favorite. Thank you for sharing your talent and the wonderful products. Your cards are so much fun! Love this collection! Oh my I love the circles and those butterflies. Your cards are so wonderful. Thank you for the inspiration. Stunning cards, every single one of them!! Thanks so much for all the inspiration, love it!! I always love the butterflies, but I really really like the Thank you wreath!